Time: 9:45 a.m. FLASH TIME!! This is a quick flash mob...great way to attend an event and still make that meeting! Hosted by: WhereRWe? & RULOST2? Time: 12 noon until ??? (even some who are not geocachers) but we let anyone join in! Don't miss it! Time: 6:00 p.m. until it's over! to take that friend who has been asking about caching. 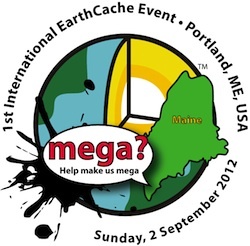 In case you haven't already heard, EARLY REGISTRATION for MAINE RESIDENTS is open for this year's 1st International EarthCache Event! All you need to qualify for this early registration is a Maine address and you're good to go...well, ok , there are some monetary concerns depending on what level you are interested in getting. The best way for you to understand what that means is to go HERE. This is a GREAT chance to get the ahead of all those flatlanders ...err...I mean summer residents and tourists, and take advantage of living in the best state in the whole U.S.! So, folks, click HERE NOW! and start planning your EarthCache adventure! Recently JustKev and I and about 50 other geocachers atteneded KachingKaren's Celebrate 2011 - "I Still Haven't Found..." event. Everyone had a super time. Here are a few shots JustKev took that day...who do you know in these pictures? Having some fun with the kiddos! Watching the kiddos have fun. Hummmmm...still can't place this guy...nice white smile though. How cool is this? I signed it and I think I haven't logged this discovery yet...ooops! Guess I'd better get going on that! Kids had some open gym time...what fun! Rick! Are you staying out of trouble, buddy? KK drawing the door prizes! HEY! A birthday boy! Happy Birthday! Oh, I remember....this guy was a door prize! remote controled shark donated by cano! to this super event. NEATO!!! I am saddened to say that this will be our last newsletter. :( Due to the speed of the Internet and social media sites, I am finding it increasingly hard to get timely new news to report to you, or news that hasn't been pictured elsewhere. I have been unable to garner enough cacher interest to get tips and news articles or requested information or pictures and I blame myself for not being able to make this newsletter intresting enough to keep your interest. I hope you have enjoyed what we have brought you in the past and I, as the writer, thank all of my readers for all you have done. Happy Caching, my friends!